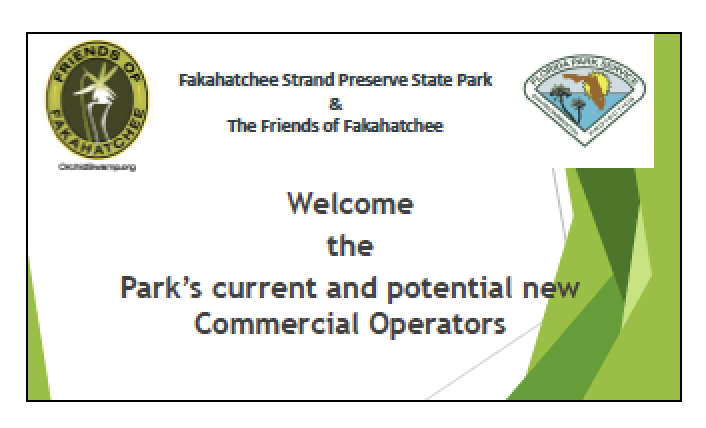 As a result of its public Call for Business Plans, the Florida Department of Environmental Protection (DEP) has selected the Friends of Fakahatchee (FOF) to manage the provision of all visitor services in Fakahatchee Strand Preserve State Park through the vehicle of a master Concession Agreement, CA-0518. 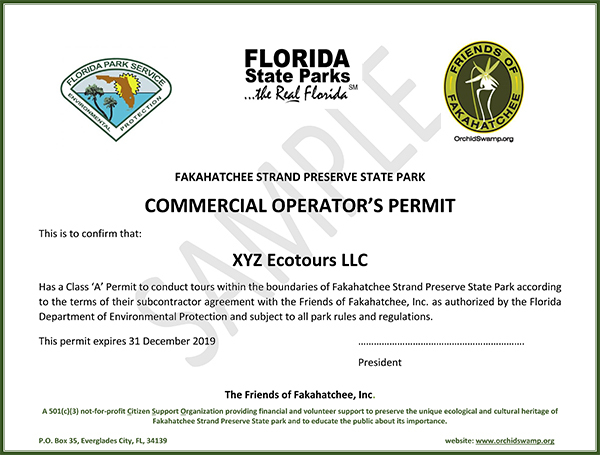 In our capacity as the park’s Citizen Support Organization (CSO), the Friends of Fakahatchee, Inc. (FOF) serves as a major funder of park operations. As part of this mission, the organization has long offered a limited number of high quality interpretive programs and tours. Now, as Concessionaire, the FOF seeks to recruit and work with excellent commercial operators to meet the growing needs of the public. Permitted concession operations provide visitor services that the park is unable to offer. “Licensed permitted commercial operators” will enhance the visitor experience as well as generate additional revenue for the Park Service. After FOF administrative expenses, all revenue generated through the program will be reinvested directly in Fakahatchee Strand Preserve State Park and its associated education, outreach and conservation programs. After November 1, 2018 all commercial operators must have a permit issued by FOF to take visitors into or conduct tours within the Park, and must display a valid permit on the windshield of any vehicle within the boundaries of the Park. This is for all areas of the park including the East River Canoe Trail and Big Cypress Bend Boardwalk area. Individual commercial tour operators will continue to take and manage their own bookings, however FOF will support them through additional marketing activities, including a ‘store front’ on this site that will describe their services and a provide a link to the commercial operator’s website. Want more information in a nutshell? Review the handout provided at the August 28, 2018 Concession Launch Meeting and/or read the news story on the evolution of the Concessionaire Program. Class A allows the permittee to conduct commercial operations in the Park such as bicycle tours, tram tours, paddling tours, swamp walks, hiking tours, and use of Big Cypress Bend Boardwalk area, subject to specific activity authorization and use area restrictions in the actual permit. In addition to the $800 annual permit fee, a monthly commission will be due on all revenues generated from activities in the park and individual park entry fees collected with it. Class B allows holder to conduct tours at the Big Cypress Bend Boardwalk only. Annual permit fee of $1,200 with no additional commission due. Class B permit holders must pay the standard individual park admission fee upon entry. Class C Permits pertain to for-profit events held in the Park authorized by the Park Manager. $250 permit fee is due for each event; special terms may apply. Food services or food truck at specific locations, times and/or events approved by the Park Manager and authorized in writing by FOF. Annual permit fee of $500 plus 10% commission. Application forms and a sample agreement may be downloaded on this site.